Archaeopteryx (see Figure 20-1) is an example of what is often referred to as a missing link. Except of course that it isn't missing anymore because we found some! Archaeopteryx is a species of bird-like dinosaur that has many of the characteristics of modern birds — feathers, wings, flying — stuff like that. But it also has characteristics typical of the dinosaur lineage from which it arose: most obviously its toothy grin! Until quite recently these authors might have maintained, and some have maintained, that the whole class of birds came suddenly into existence during the eocene period; but now we know, on the authority of Professor Owen, that a bird certainly lived during the deposition of the upper greensand; and still more recently, that strange bird, the Archeopteryx, with a long lizard-like tail, bearing a pair of feathers on each joint, and with its wings furnished with two free claws, has been discovered in the oolitic slates of Solenhofen. Hardly any recent discovery shows more forcibly than this how little we as yet know of the former inhabitants of the world. As you can imagine, this discovery caused quite a stir for such a small creature. Archaeopteryx was about a foot and a half from nose to tail, hardly what we think about when we think about dinosaurs, but — ignoring the distraction of wings and feathers for a minute — many of its structures are clearly related to the dinosaurs. So it turns out the dinosaur branch of the family tree did not entirely die out. One small branch, the birds, remains with us still. That birds might be a surviving lineage of the dinosaur branch of the tree of life was originally proposed by one of Darwin's contemporaries, Thomas Huxley, but the idea never really caught on. It wasn't until the 1970s and the developments of phylogenetic analysis that the question was revisited and found to have overwhelming support. Woolly mammoths lived at the same time as early humans but went extinct about 10,000 years ago. At least scientists thought so until the late 20th century discovery of fossils on Wrangle Island, off the coast of Siberia. Mammoths were living on this island as recently as 4,000 years ago — the same period when the Egyptians were building the pyramids. These island mammoths are especially cool not because they survived to historical times (though that fact is fascinating), but because they were miniature mammoths, only about 7 feet tall — the Shetland ponies of the mammoth family. Why would pint-size mammoths have evolved? Possibly because there was no advantage to being huge on islands. One of the major advantages of being a very large animal is that you're just too big for any predators to attack. When an elephant — or a mammoth, I suppose — reaches a certain size, nothing is going to eat it. But being large also has costs. An African elephant needs to eat around 300 pounds of food and drink 50 gallons of water every day. The evolution of smaller mammoths could have been selectively advantageous if the species had no predators on the island. Smaller mammoths that could survive on less food would be less likely to starve. The largest living flying bird in the world is the Andean condor, which can have a wingspan of more than 10 feet. 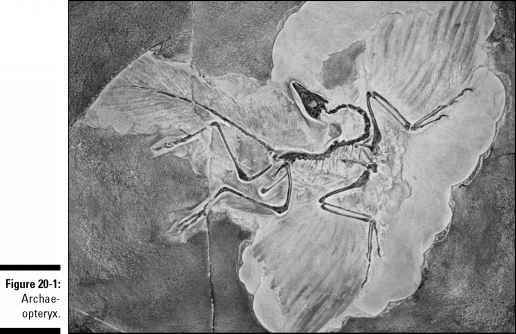 Go back in time, and you can find fossils of an extinct bird with a wingspan twice as big — a creature that would make Big Bird look small. To find the largest animal that ever flew, you need to go back even farther — 65 million years back, in fact, to the time of the pterosaurs (or pterodactyls, as they are often called). Evolutionists like pterosaurs not just because the group includes the largest creature that ever flew, but also because it's represents yet another independent origin of the ability to fly. Pterosaurs' wings were structured differently from those of other vertebrate lineages that have taken to the air: birds and bats (which also differ from each other). In bats, for example, the wing is supported by the elongated digits of the forelimbs, but in pterosaurs, the wing was supported by an elongated third finger with the other digits being much reduced. Both mechanisms work to make a wing, but the random process of mutation and differences in initial structures nudged these lineages down different pathways. If you ever owned an animal fossil, chances are that it was a trilobite — one of the most common types of animal fossils (see Figure 20-2). 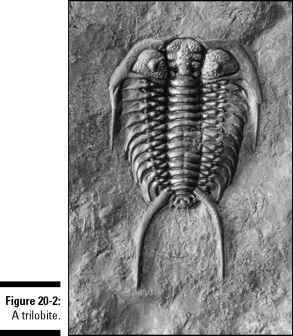 Trilobites were arthropods (things like lobsters, spiders, and bumblebees) that lived in the ocean. They appeared in the fossil record more than 540 million years ago and went extinct 250 million years ago. l Different trilobite species evolved different body shapes. Some were smooth; others were extremely spiny. They ranged in size from a few millimeters to a couple of feet. l Some lineages had the ability to dig burrows; others were able to roll up in balls, like pillbugs and hedgehogs; and some evolved the ability to swim. l They inhabited shallow waters as well as deep waters, though they have not been found in any freshwater environments. Just as important as the trilobite-specific information that these fossils offer is what they show about the time frame of evolutionary transitions in lineages with a plentiful fossil record. We have so few human fossils, for example, that it's reasonable to assume we will miss transitional forms because the hominid fossil record is poor. Even though trilobite fossils are numerous, we still see sudden (in geological time) transitions and the rapid appearance of new forms in this lineage. Where speciation events occur in a small, localized area, the probability of finding intermediate forms decreases, and the fossil record appears to contain more sudden transitions as species appear and go extinct. Head to Chapter 8 for info on speciation. Perhaps you've seen cartoons depicting the transition of vertebrates from water to land animals. Usually, these drawings show some sort of fish with stubby little legs, which isn't too far off the truth. Scientists recently found a fossil quite similar to the type that's famous from all those evolution cartoons: Tiktaalik rosea. Tiktaalik has a lot of fishlike structures, such as fins, scales, and gills. But its "fins" have a leg-like structure with wrists and parts like a hand or fingers (see Figure 20-3). This critter could do pushups! It's not clear to what extent Tiktaalik left the water, if it did at all. Some scientists hypothesize that this new fin structure would have been advantageous for maintaining position in fast-flowing shallow water. Other interesting characteristics of this fossil are its neck and the eyes on top of its head — more like a crocodile than a salmon. What scientists have discovered from this fossil is that the anatomical modifications associated with the transition to land may have evolved first in the water. The Burgess Shale is a concentration of fossils in the Canadian Rockies containing large numbers of morphologically distinct species that at first glance don't seem much like the organisms that are around today. 1 Their excellent degree of preservation often reveals intricate structures of the softer body parts. 1 The large diversity of forms that were new to science raises interesting questions about the evolutionary history of life on Earth. For the most part with fossils, it's possible to identify the major group to which the organism belongs. For example, you might know that a particular fossil is a clam, perhaps not like any clam we have today, but a clam nevertheless. Before the discovery of the Burgess shale, scientists could identify fossil animals as earlier members of particular branches of the tree of life. Trilobites (see the preceding section), for example, were recognizable as members of the arthropods branch. But when the animals in the Burgess Shale were examined, it wasn't clear immediately what groups many organisms belonged to, and in some cases, such as the organism hallucigenia, it wasn't even immediately clear which end was up (see Figure 20-4). 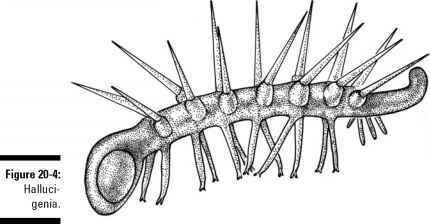 Creatures like hallucigenia make one think that perhaps many such interesting and unusual creatures have evolved and subsequently gone extinct. On subsequent analysis, and with the passing of considerable time and effort, scientists have been able to assign many of the fossils found in the Burgess Shale to existing groups. But some fossils still defy placement and may indeed be examples of unique body plans that turned out to be evolutionary dead ends. Stromatolite fossils dating back more than 3 billion years are among the oldest fossilized evidence of life on Earth. Stromatolites are pillars formed by layer upon layer of microorganisms, such as cyanobacteria (see "Microfossils," later in this chapter). These layers trap sediments that become incorporated into the structure, or in some cases, the organisms themselves are responsible for producing calcium carbonate, which becomes a component of a structure. Either way, when the structure is fossilized, the layers are visible as bands in the columnar structure. Stromatolites are common in the fossil record; however, it wasn't until the discovery of living stromatolites that we could be sure that these structures were the result of biological activity. While there certainly seem to have been a fair number of stromatolites formed billions of years ago, they are a lot less frequent now. Living stromatolite structures are currently found only in areas where there are no predators to feed on the layers of microorganisms. In the days before anything else had evolved to eat them, being eaten wasn't a problem. Today, they're just out of luck in most places. Cyanobacteria: The earliest cyanobacterial fossils date from approximately 3.6 billion years ago, and for the longest time, such single-cell organisms were the only life on the planet. Interestingly, the earliest fossils of these microorganisms are extremely similar to those that exist today. Foraminifera: Organisms typically about a millimeter in size that produce hard shells, with each species being unique. Because the species present at any given time vary (as a result of extinction and speciation), scientists can use the species to date different geological strata. If they find the same collection of foraminifera species in two samples, they know that the samples date from the same time. That info may seem rather useless, but it's pretty handy for marine oil exploration. Suppose that you find oil in strata of a particular age. Naturally, you want to explore the strata in a nearby location. But because of geological activity, the strata may be at a different depth in the second location. By analyzing the various species of foraminifera across the two locations, you can match strata of similar ages. make inferences about climate change over shorter time scales, observing how pollen from plants characteristic of one set of environmental conditions is replaced in subsequent strata by pollen from plants characteristic of a different set of environmental conditions. Amber is fossilized tree sap. It's quite commonly used in jewelry and has a beautiful golden color. As nice as the sap itself is, the really interesting thing about amber is that organisms — plant parts (such as leaves, seeds, and flowers), small mushrooms (representing fungi), insects, snails, spiders, and even frogs — can become trapped in it. These trapped organisms retain incredibly fine detail. 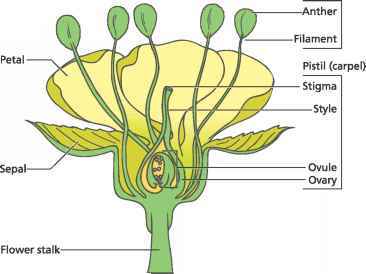 Flowers, for example, can appear perfectly preserved. For groups that are poorly represented in other forms of fossils, amber provides the best clues about the timing of various evolutionary events. Spiders, for example, are quite rare in the fossil record because they don't have hard exoskeletons, but these creatures, and even their fossilized webs, turn up in amber. Data from amber allows researchers to date the evolution of spider webs to more than 100 million years ago. A 130-million-year-old spider-web fossil has been preserved with enough detail that you can see the individual droplets of glue the spider placed on the web!